The thing that really makes this dish is the noodles. 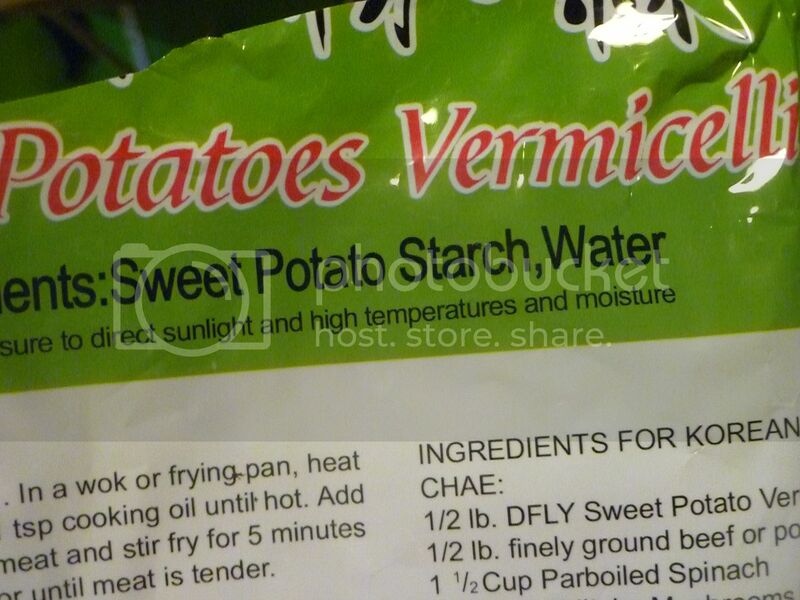 You have to use sweet potato noodles. You could use noodles made with rice or beans, but they're just not the same. 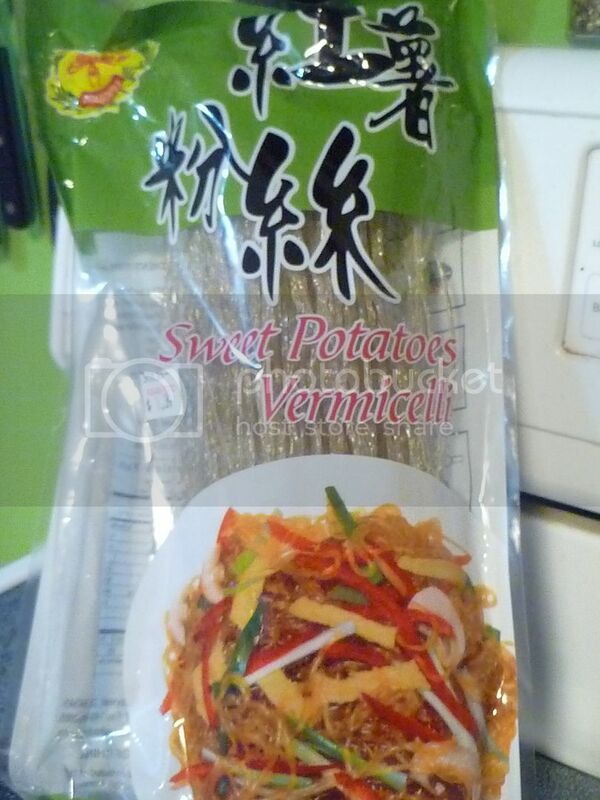 You should be able to find sweet potato noodles (also called dangmyeon) at Asian food stores. For some reason, my regular grocery store had half a dozen different kinds of rice noodles, half a dozen kinds of bean thread noodles, but no sweet potato noodles. They also had that many kinds of rice wine vinegar, but no mirin. Very odd and irritating. 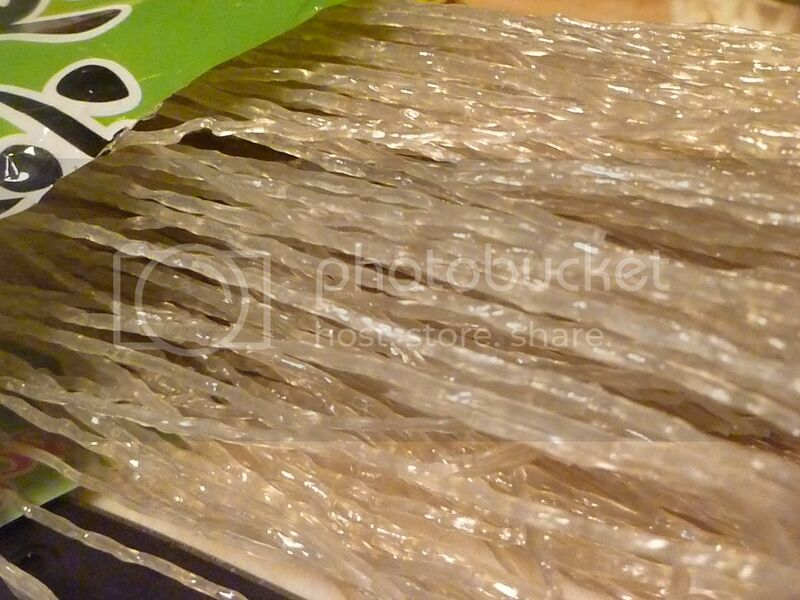 Here are what the noodles look like up close. They're shiny and sort of clear, and they're on the thicker side. They seem to stretch out once they're cooked. And they're very, very long. 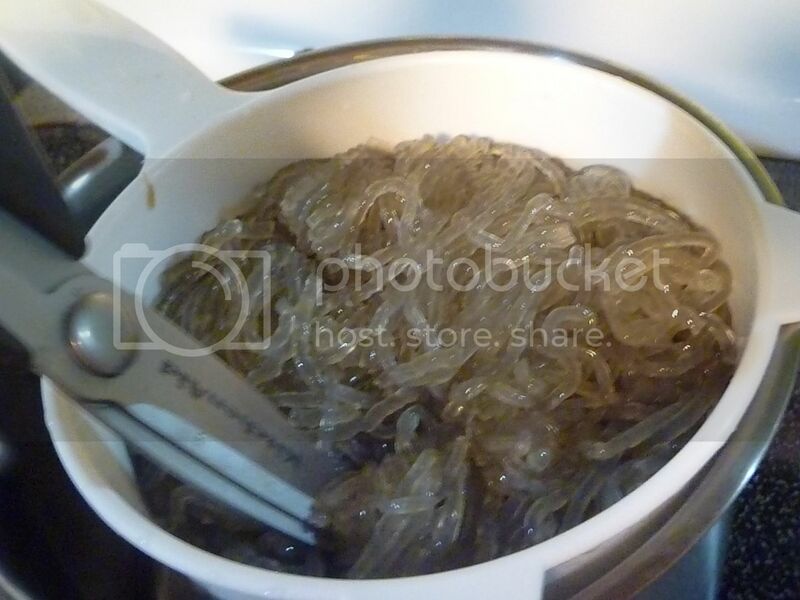 Cook the noodles like you would cook any noodles, in boiling water. The package said to boil them for 5 minutes, but they still seemed pretty chewy. Next time I'll cook them for 8-10 minutes. 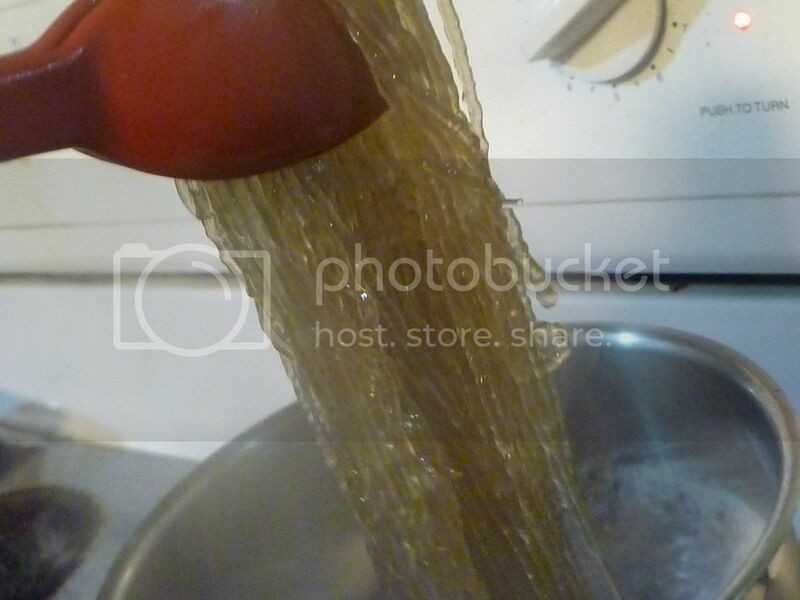 Drain the noodles, and rinse with cold water. Grab some clean scissors and cut the noodles several times, to make them shorter. I'm a little confused as to why this step is necessary--couldn't they just make the noodles shorter in the first place? One of life's mysteries, I guess. 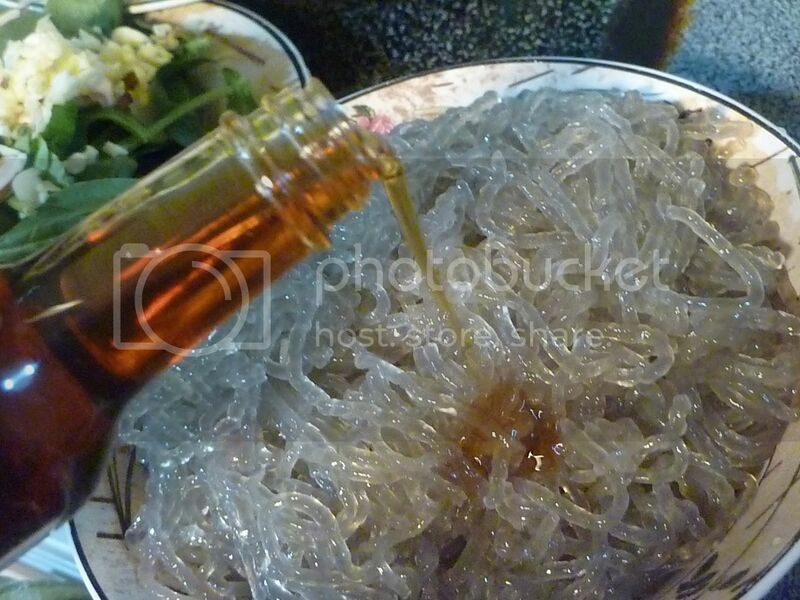 Toss the cooled and drained noodles with some sesame oil, to keep them from sticking together. Then set the noodles aside. 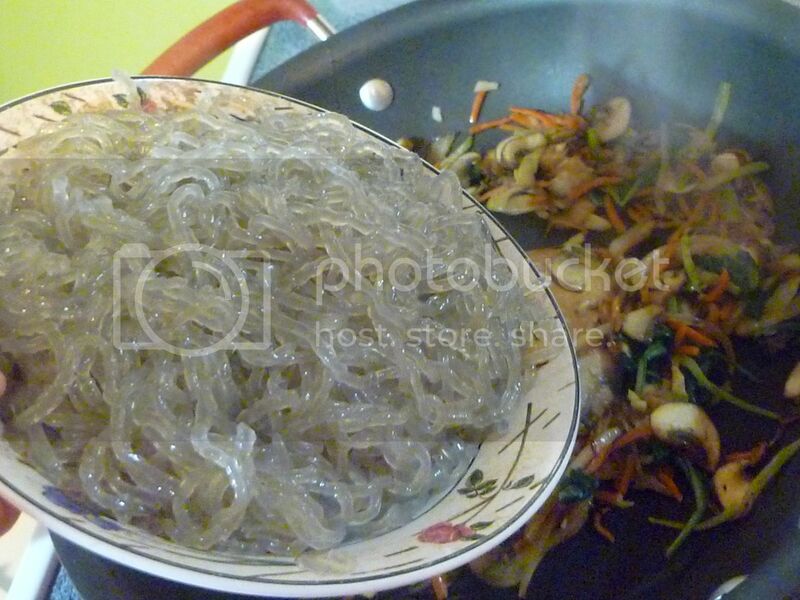 Chap chae is essentially stir-fried noodles with vegetables. So you'll need to choose which vegetables you want to add. 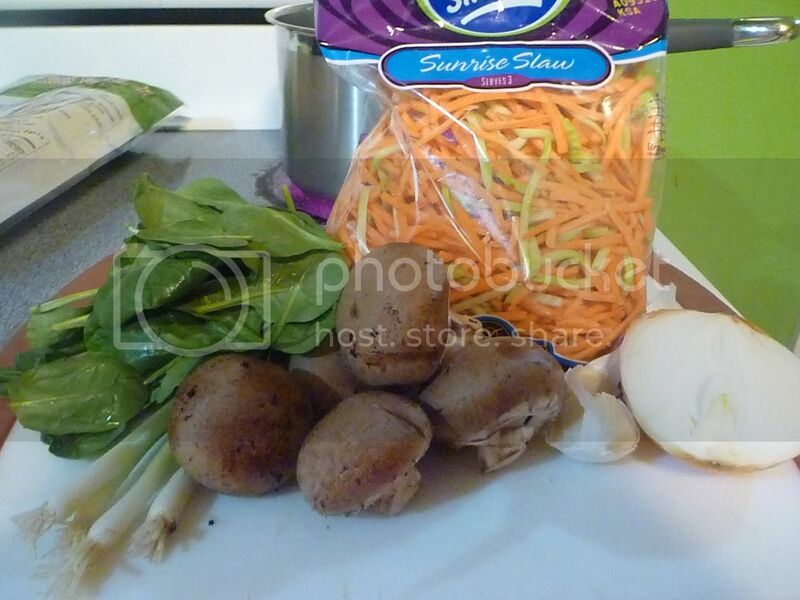 I used traditional ingredients--onion, green onion, garlic, mushrooms, spinach, and shredded carrots. I was too lazy to grate my own carrots, and couldn't find plain grated carrots at the store, so I picked up this "Sunrise Slaw", which was a blend of carrots and broccoli. I also wanted to use more traditional mushrooms, perhaps oyster or enoki, but the post-Thanksgiving offerings at my store weren't great. So crimini it was. I sliced the vegetables (or minced, in the garlic's case) and divided them onto two plates. 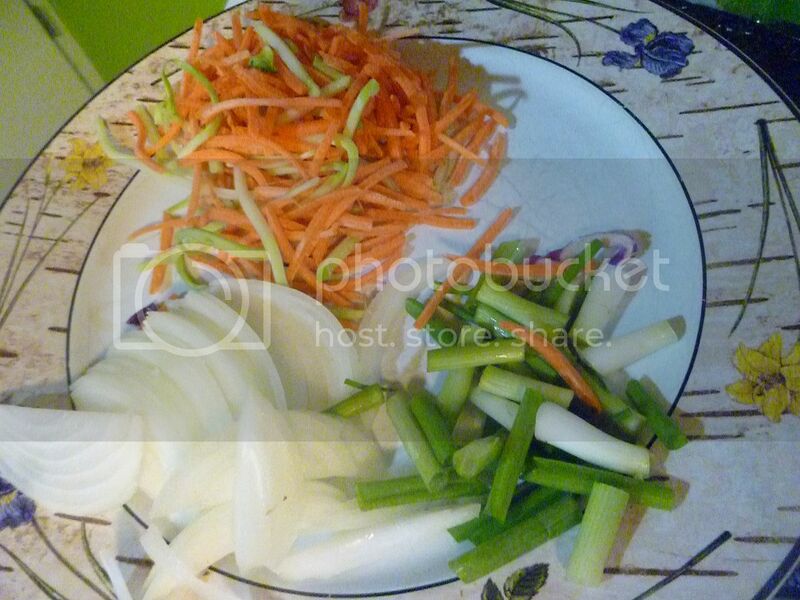 The first plate was the vegetables that cook slower--the carrots, onion, and green onion. 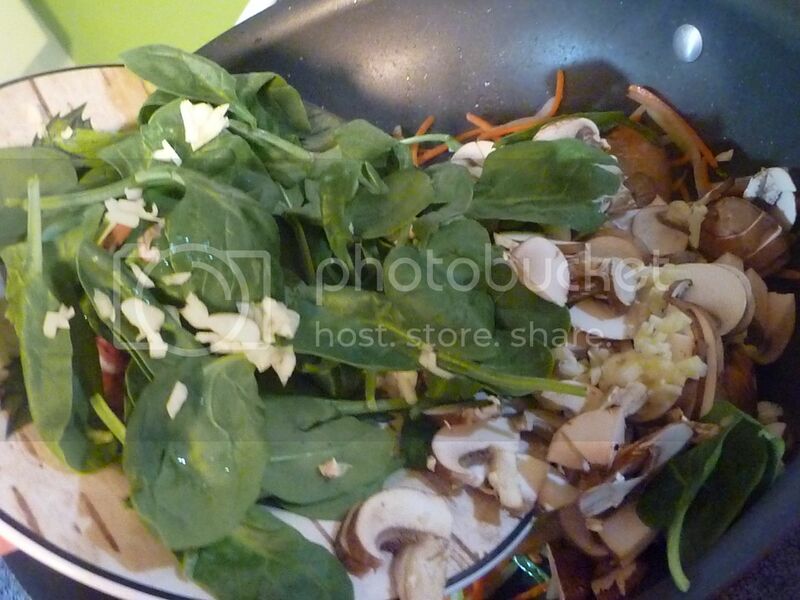 The second plate had the fast-cooking veggies--the spinach, mushrooms, and garlic. I heated some oil over high heat in a large pan. 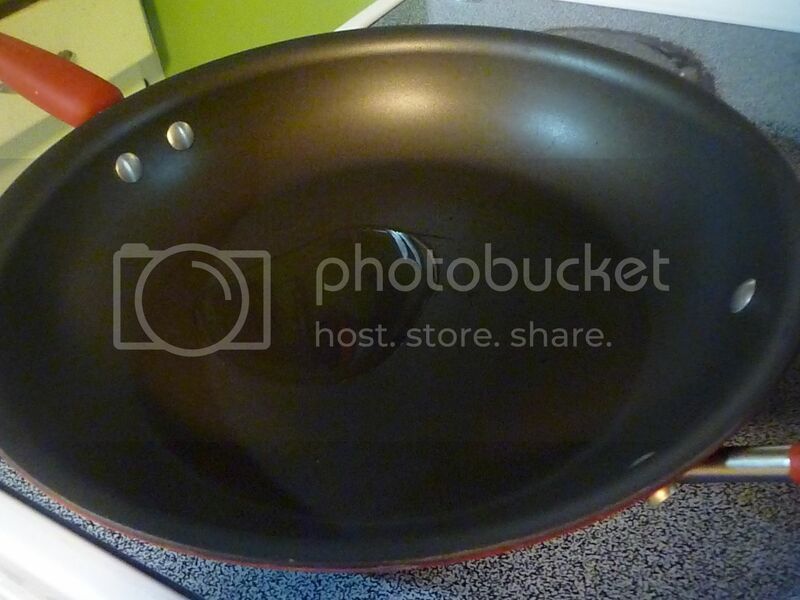 I have a wok--somewhere. I couldn't find it. So I used a pan. Once the pan was smoking hot, I very carefully added the contents of my "slow cook" plate. Be extra careful, green onions pop! Stir fry the vegetables for several minutes until they start to look softened. Then you can add the "fast cook" plate. Again, stir fry until the veggies look cooked. 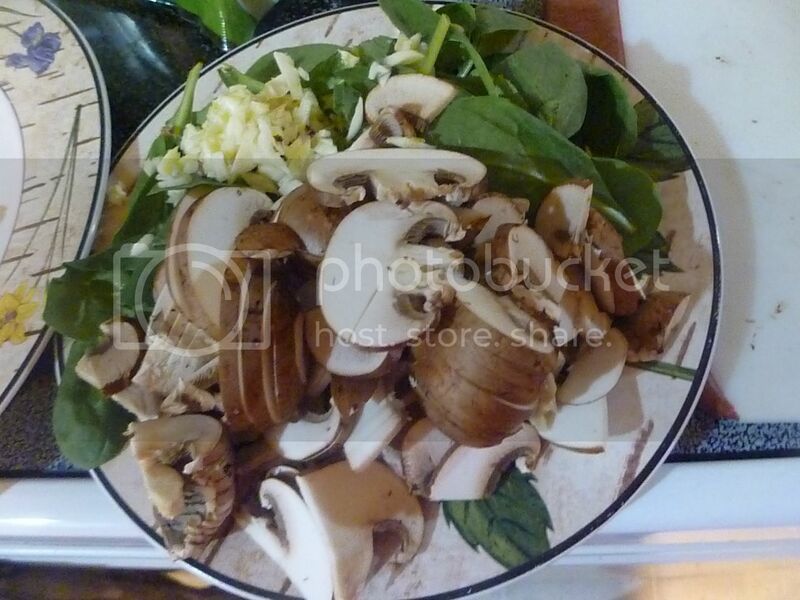 The spinach should be wilted, and the mushrooms should be picking up some nice golden brown color. Then carefully add the noodles. Pour in some soy, for flavor. If you have mirin, add it now. I definitely missed its presence. In case you're unfamiliar with it, mirin's a sweet rice wine used in cooking. 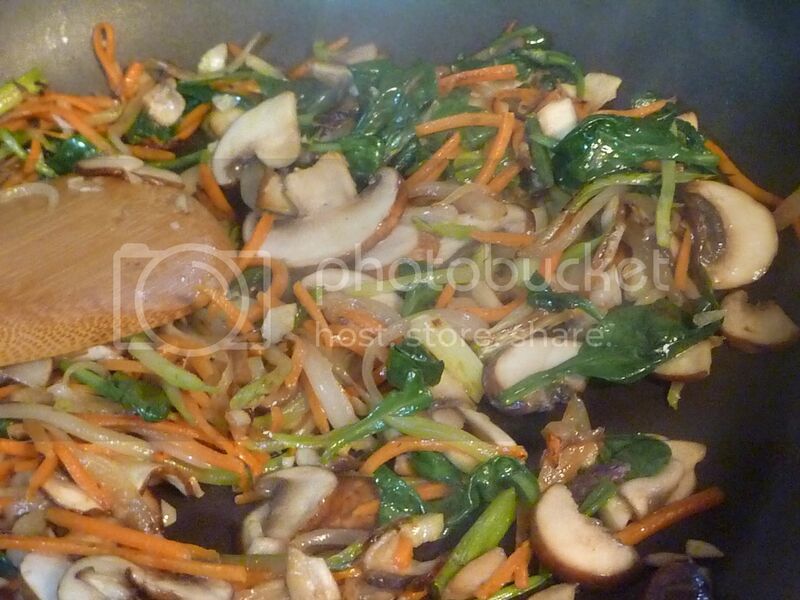 Stir fry the noodles until they're well coated in the sauce and the vegetables are well-tossed throughout. 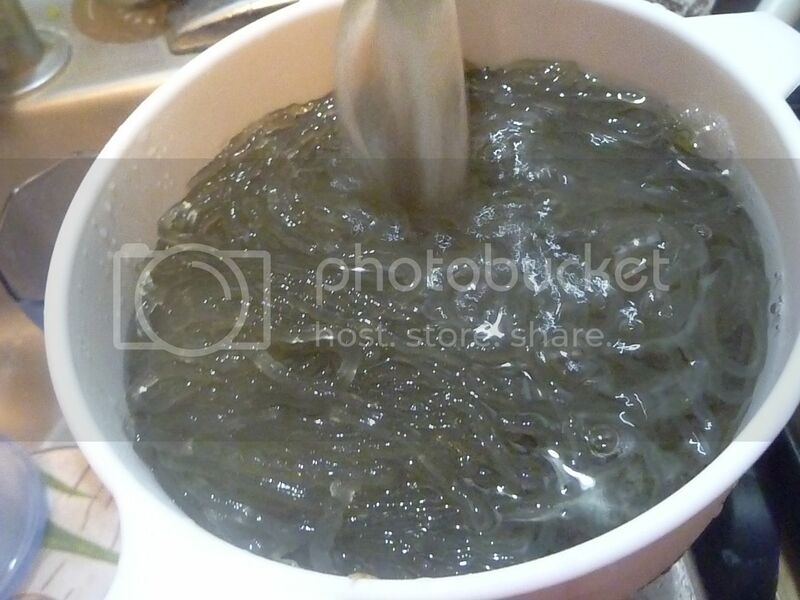 If the noodles start to stick, add a bit more soy, or some water. Right before serving, add the sesame seeds. Toss, and serve! 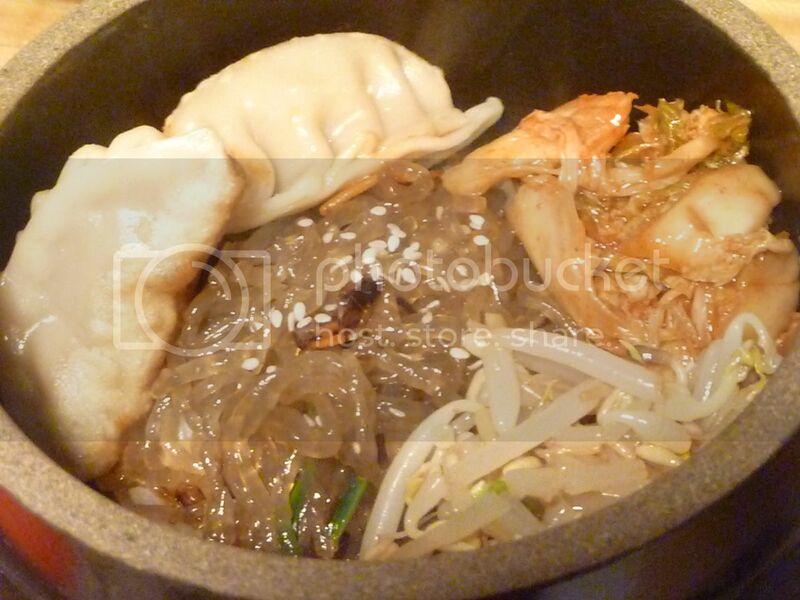 I served mine with rice, kimchi, bean sprout panchan, and store-bought dumplings. It wasn't quite the same as going out, eating chap chae prepared and served by Koreans who eat it every day, but for a first try I've got to say it was delicious! 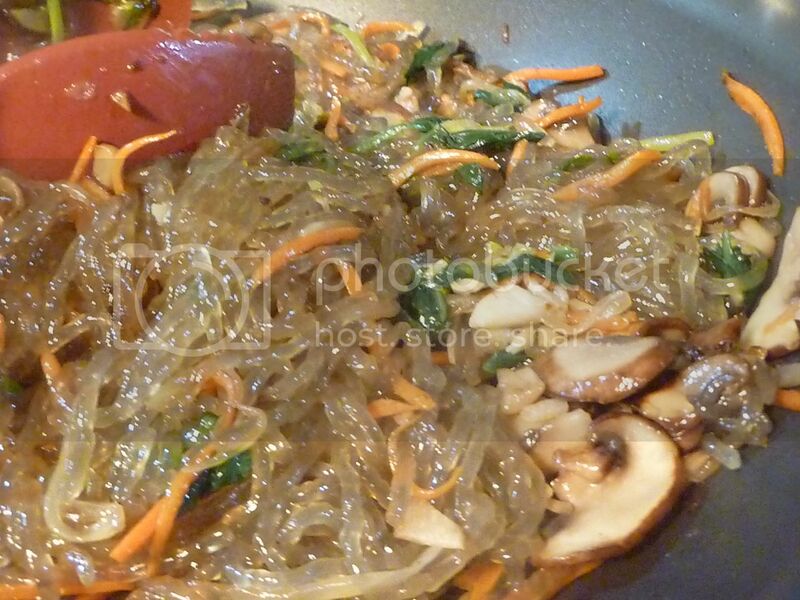 Cook sweet potato noodles in boiling water for 8-10 minutes. Drain and rinse with cold water; toss with sesame oil. Set aside. 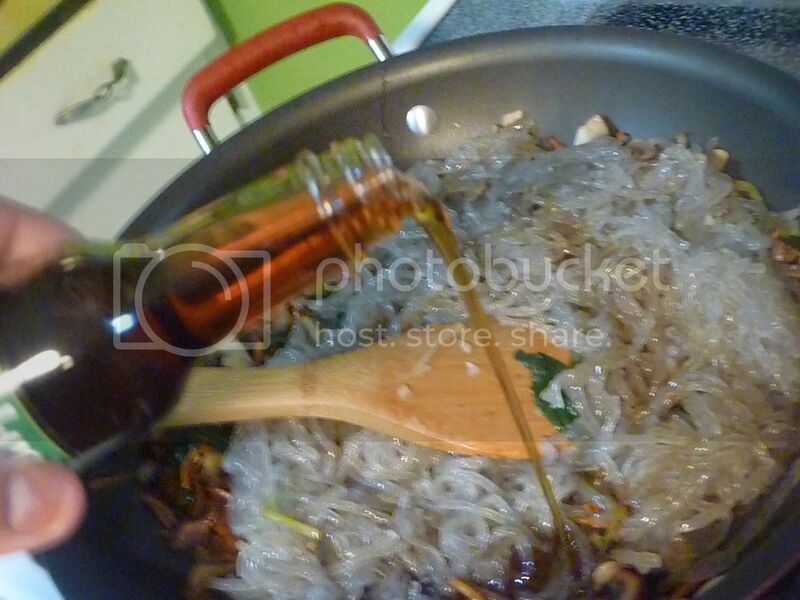 Heat oil in a large pan or wok over high heat. 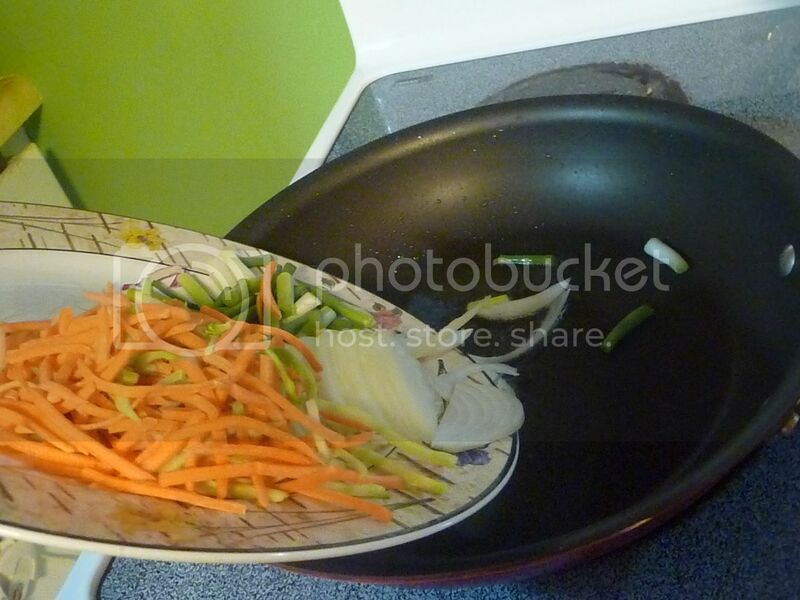 When oil is smoking hot, add onions, carrots, and green onions. 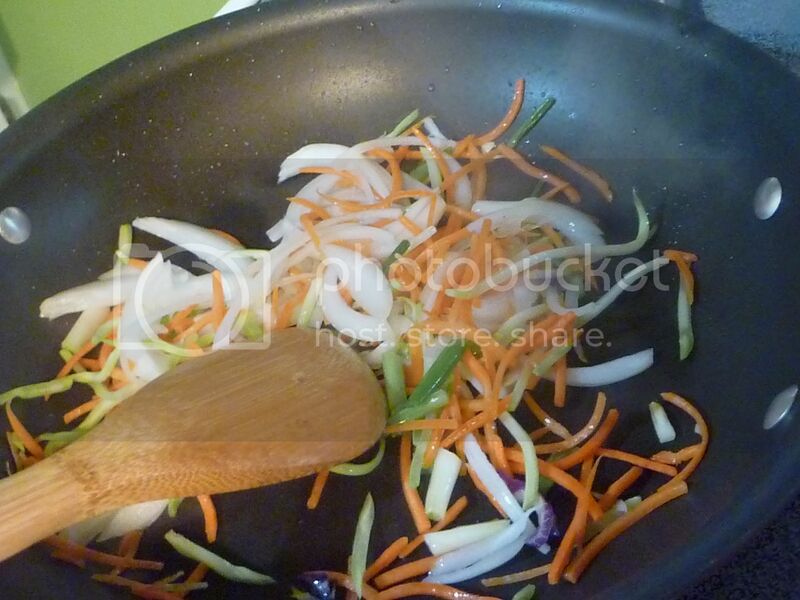 Stir fry until vegetables are softened. Add garlic, mushrooms, and spinach. Saute until garlic is fragrant, spinach is wilted, and mushrooms are beginning to turn golden brown. 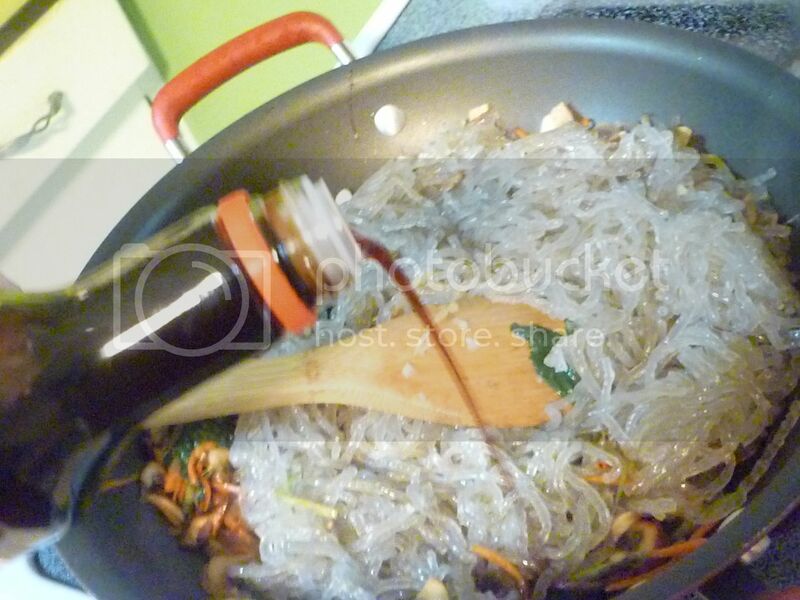 Add sweet potato noodles. Add soy sauce, sesame oil, and mirin. 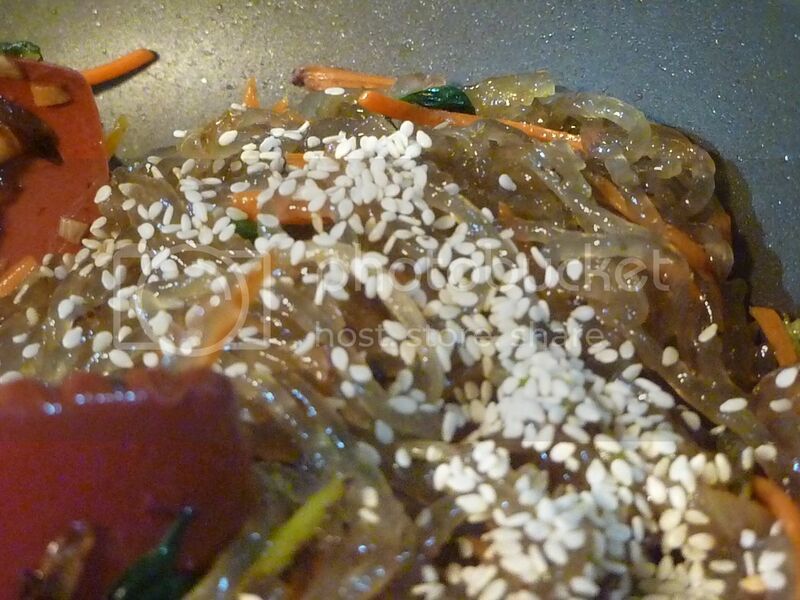 Toss and stir fry until noodles are well coated and vegetables are tossed throughout. Sprinkle in sesame seeds; serve. What kind/brand of dumplings do you buy? I love, love, love them but can't seem to find a good store brand.